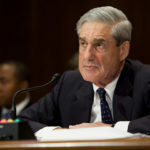 According to Donald Trump’s handpicked Attorney General William Barr, the still-secret Mueller report has concluded that there was no collusion between the Trump campaign and Russia. This is, of course, a lie. We’ve already seen Mueller spell out specific acts of collusion in his court filings, and we’ve seen members of Team Trump publicly confess to collusion. So how is Barr managing to fudge this? Democratic Congressman Denny Heck, who sits on the House Intelligence Committee, appeared on MSNBC this evening and explained how William Barr managed to misleadingly word his “summary” in order to pretend that all the collusion found by Mueller somehow isn’t in the report. Heck pointed to the specific wording used by Barr. Barr claims that Mueller found no collusion between the Trump campaign and “the Russian government” as opposed to “Russia.” Why would Barr be so oddly specific in his wording? Yes, Barr appears to be quoting Mueller here. But as we explored earlier this evening, Barr’s report is full of brief partial-sentence Mueller quotes, and it’s not difficult to figure out that much or all of it is out of context. For all we know, Mueller said there was no collusion “directly with the Russian government” and then went on to lay out all the examples of the Trump campaign knowingly colluding indirectly with the Russian government. When Donald Trump’s guy Paul Manafort gave internal polling data to Konstantin Kilimnik, Manafort wasn’t technically colluding with the Russian government, because Kilimnik is merely an alleged Russian government spy. When Donald Trump Jr met with Natalia Veselnitskaya at Trump Tower, he wasn’t technically colluding with the Russian government, even though he attended the meeting with the intent of receiving dirt on Hillary Clinton, because Veselnitskaya is merely an attorney who often represents the highest levels of the Kremlin, and not technically a Kremlin employee or officer. We think Congressman Heck is onto something here. William Barr says that “the investigation did not establish that members of the Trump Campaign conspired or coordinated with the Russian government in its election interference activities.” That’s obviously a false statement – unless Barr is hiding behind the technicality that Kremlin operatives like Kilimnik and Veselnitskaya only unofficially represent the Kremlin. For the record, Mueller criminally indicted Kilimnik and Veselnitskaya, and they’re both currently considered fugitives.